Game-based learning is a big subject, and you could go broad, or you could go deep. It means very different things to very different people. I’m thinking about just one facet of it, gaining an introduction to computer science and computational thinking through the design of games. Before we go any further, we need to do some disambiguation. This is not gamification. Gamification is the application of game techniques in non-game environments. It is used as an extrinsic motivator in regular courseware, and it usually takes the form of points, a leaderboard, and badges. It may be used in more subtle ways, like upvoting in forums and a reward for best post. Nor am I talking about fully-worked strategy games like Civilization, or fast action multi-player games, not in this article. Creating games like these is at a level of human achievement second only to building a railway through the jungle. What I am talking about is scrolling platform games, like Super Mario, and top-down adventures, explorations, and simulations. The emphasis is on storytelling, and there are strong links to the curriculum. 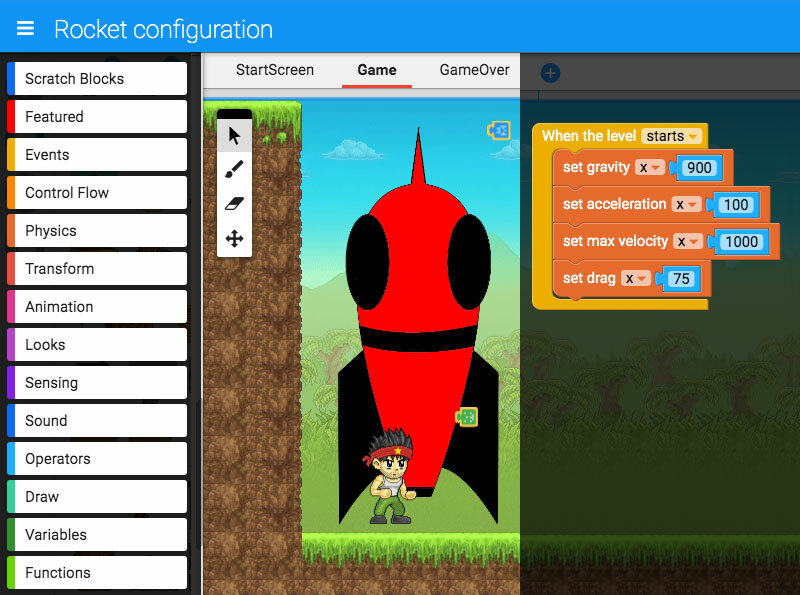 Using a web application such as Gamefroot, which supports block coding, students can start from a young age exploring the wonderful sense of agency that happens when you tell computers what to do. In this initial sketch the scoping exercise is done. It is easy, for example, to draw a robotic arm for manipulating rock samples, but to animate and code it would truly be a mission into deep space. 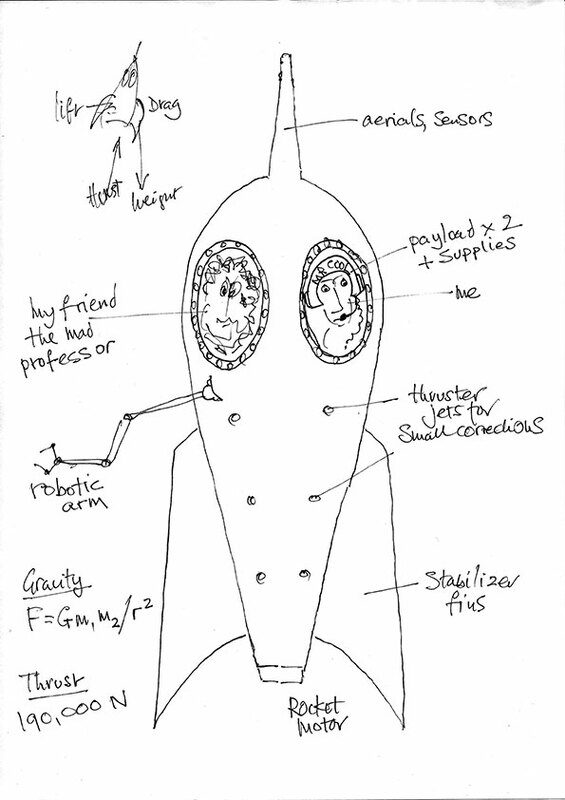 Note that the learner is starting to consider the forces acting on the rocket: gravity, weight, and drag and the thrust that will be needed to overcome them. Graphic by Stephen Lowe, all rights reserved. In the future everyone will not be a computer programmer. So what is the point of students learning coding at school? Edsger Dijkstra, the revered matua of computer programming, is famous for saying, “Computer Science is no more about computers than astronomy is about telescopes.” What he was trying to say is that Computer Science is a way of thinking, a lens through which to understand the world. Living in a world where even your wristwatch is a computer, where robots do factory jobs, and driverless taxis take us across town it has to be important to have this Computational Thinking lens in your kete. It’s the new literacy. Isn’t Computational Thinking just a buzz word for mental arithmetic? I’d be the first person to lament the passing of mental arithmetic. It’s a skill, a knack, that was distributed through all layers of our society in a time when we still carried notes and coins in our purses and calculators were heavy mechanical devices. Take the slide-rule, a more portable calculator of the recent past. For an engineer or a navigator to use a slide rule they had to know the order of the answer before they started, the slide rule merely filled in the detail. Shop assistants working the till could do mental gymnastics at light speed. Gone. Now the domain of eccentric hobbyists. Computational thinking is a different animal altogether. It’s about decomposition, abstraction, algorithm design, and pattern recognition. When we do stuff like that, far from weakening our brains, we start to see the world in a whole different way. Seeing things in a different way is one of the most important things we as humans can learn, because it gives us what we need to adapt and survive. Game-based learning as it might be practiced in schools today stands on firm foundations. Surprisingly perhaps, it is neither new, nor is it experimental. Seymour Papert’s book Mindstorms: Children, Computers, and Powerful Ideas was published in 1980. That’s forty years ago. In the foreword Papert refers to the transitional object. That’s what the sprites in the game become, objects that embody higher and more abstract concepts. Objects to think with. Mitchell Resnick, who was a student of Papert, started Computer Clubhouse in 1993. This free after school club instantiated Papert’s thesis of social constructionism. Today it has matured into The Clubhouse Network “where young people from underserved communities work with adult mentors to explore their own ideas, develop new skills, and build confidence in themselves through the use of technology”. It is a worldwide network with nodes in eighteen countries. Sugata Mitra is best known for his Hole in the Wall Project in 1999. It has come in for quite a bit of criticism, but personally I buy into it. The gist of it is that, left to get on with it, children learn naturally. The role of the teacher changes, providing the learners with a safe environment, resources, and encouragement. Game-based education has elements of MIE (Minimally Invasive Education) and SOLE (Self Organised Learning Environments). This is in keeping with modern trends in education where children are afforded greater agency. Here the final artwork has been completed. 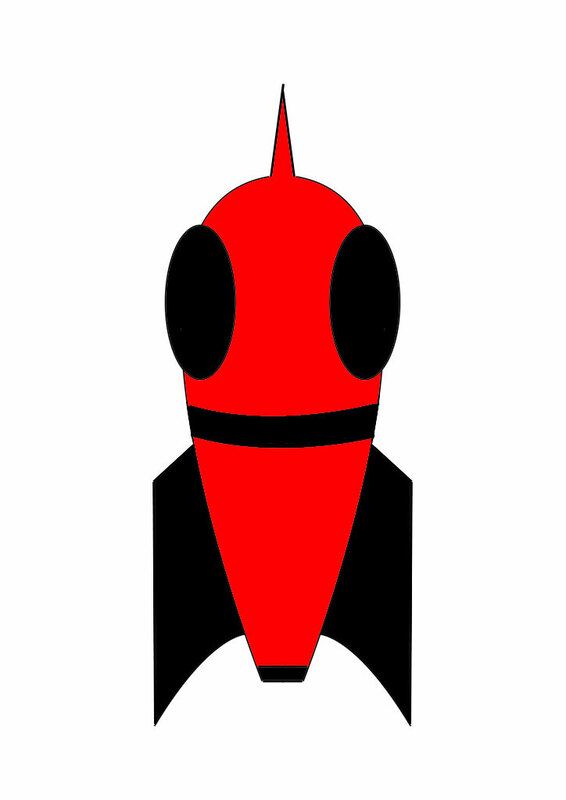 Fully saturated colours have been chosen, and some of the finer detail dropped to create a pleasing cartoon representation of a rocket. 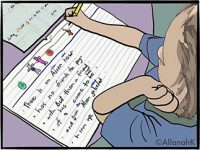 Note that the learner has had to explore the genre and will have tested their colour scheme against intended backgrounds. Graphic by Stephen Lowe, all rights reserved. So what are these transitional objects called sprites and where do you get them? Sprites are the actors in a game. In a gaming world an object like a planet or a rock might be as much an actor as is a rocket or a cosmonaut. Learners drag objects from a library onto the stage, at which point they become sprites. Scripts are attached to them to cause them to do things like move, interact with other sprites, and interact with the scene. The scene is made up of tiles. Learners can use ready-made collections of objects, or they can draw their own according to the time they have available, their level of study, and their aptitude. What are the powerful ideas, the higher and more abstract concepts? So, it’s pretty easy to understand that you can attach scripts, and tell your rocket to move. But let’s extend this just a little bit and see where it goes. Assume in the first place you want to escape Earth’s gravity. How much thrust will you need, and for how long? The space shuttle needed 1.2 million pounds of thrust for 6 minutes to reach orbit at 17,000 miles per hour. Now do you see where this is going? How this meshes with STEM? Let us now visit three planets, each with a different gravity to Earth. We want gentle landings and successful escape from their gravitational fields. This simulation, with some timely prompts from a game-savvy teacher, will cover Science, Technology, Engineering, and Maths. It’s going to be fun. But it’s going to be “hard fun”, a term Papert himself used. And the higher and more abstract concepts, what about them? Computational Thinking, as we explored earlier, is not just maths. Computational Thinking is about how to think and how to solve problems. It’s about Decomposition, Abstraction, Algorithm design, and Pattern recognition. The meat in tomorrow’s sandwich. While Gamefroot comes with a good library of game objects there is something satisfying about drawing your own. Gamefroot is about learning coding, but it can be about creating game art too. Note that in the attached script values are assigned to the concepts of gravity, thrust, acceleration, and drag. Experimenting with the balance of these values will affect the behaviour of the rocket. Graphics by Stephen Lowe and Gamefroot, all rights reserved. I hope the argument I have presented here helps in the challenge to convince sceptical parents that games-based learning is not an ill-defined liberal whim, but a well-established pedagogy standing on solid foundations of research and practice. Working with individual students to move them from fun to hard fun will sometimes be a challenge, but in many cases will be surprisingly easy. The joy of the games-based learning approach is that each learner will be able to perform to the best of their ability scaffolded by a framework that really knows no bounds. Teachers will face challenges. It is important to remember that you do not have to keep one click ahead of the kids, you can happily let them overtake you in that respect. If this aspect of game-based learning is stressing you I suggest you follow the links I offered earlier to Sugata Mitra’s work. 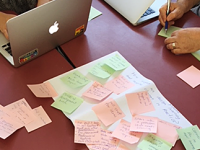 Kia Takatū ā-Matihiku CORE Education are partners in this valuable self review tool. Find out how ready you are to implement the new curriculum content and catch up with students. Completing the review takes five to ten minutes and all of the results are confidential to you. Educational Games Design Fundamentals: A journey to creating intrinsically motivating learning experiences by George Kalmpourtz. (Expensive but comprehensive). Algorithms to Live By The Computer Science of Human Decisions by Brian Christian and Tom Griffiths (Requires no maths to get the most from it). The Art of Game Design A Deck of Lenses by Jesse Schell (Useful in the classroom). Stephen Lowe has an MSc in Computer Science from University of Liverpool in the UK. He developed and taught a 3-year multimedia course at Aoraki Polytechnic before coming to CORE Education seven years ago as a Learning Designer. 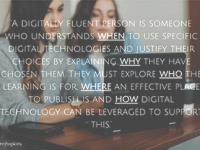 Digital Fluency, Literacy or Technology: what’s the difference?